Someone once told me, "If you want to have an interesting life, surround yourself with interesting people." I've thought of that advice often throughout my life, but never more so than I have during my time here at Augustana. Each day that I walk the footpaths of this campus - a place our own Dr. Patrick Hicks called "an island of youth and ambition" in his poem, "Restoring the Eidsvaag Bell," I have to remind myself that this is where I work. This is where I work. How lucky – how very, very lucky, am I? The amazing things that happen here (thanks to our incredible faculty and staff), along with the awe-inspiring work of our students, make each day at Augustana remarkable indeed. Yet, as I think about recent and upcoming events, I find myself full of both wonder and excitement. Earlier this month, former U.S. Secretary of State Madeleine Albright spoke at the 2010 Boe Forum on Public Affairs, organized by the Center for Western Studies. In addition to her address, entitled "Geopolitics and the Implications for Doing Business and Investing Around the World," Dr. Albright took time to participate in a group discussion with our students – an experience we're certain they'll revere and treasure. Our campus also hosted Tim Westergren, founder of Pandora, the Internet Radio choice of more than 65 million people worldwide. Westergren and students participated in a Q&A session around music and technology in Kresge Recital Hall. Next month, the campus will come alive with the sights and sounds of the holiday season. This year we're excited for our Vespers services, an intimate musical worship service featuring the Augustana Choir, faculty and members of the South Dakota Symphony performing "Song of Luke," a cantata by Cyprian Consiglio. Consiglio, a Camaldolese monk, ordained priest, recording artist, performer and composer, collaborated closely with our own Dr. John Pennington to develop the oratorio based on the narrative of Jesus' infancy, according to the Gospel of Luke. All of this occurs as we celebrate Augustana's 150th anniversary – a year in which we pay tribute to a group of restless adventurers from rugged lands in the North Sea; a people history describes as bold and fearless. They were the Vikings. And they are, with whom, our story began. Consultant and author Tom Veblen provides thoughts to ponder about a certain spirit he attributes to his Scandinavian ancestors, a force he labels: Going Viking! To Veblen, Going Viking means much more than "to get into a long wooden boat with your sword and [your] friends and sail out in search of trade and plunder." Veblen believes the age of the Viking has persevered through time and lives on even today. He describes the concept of Going Viking as "to be venturesome, explore, discover; ...to exert oneself, [to] aspire; ...to take a stab at, have a go, a crack, a whack, or [a] shot at; ...to pursue hard, bold, dangerous, or important undertakings." The Augustana Vikings have been, and will always be, those who explore, discover, and pursue important undertakings; those who seek adventure and aspire for more than the ordinary; those who are truly interesting people. In this, our Sesquicentennial year, we honor our heritage and traditions as we step boldy into the future and create an Augustana like never before. 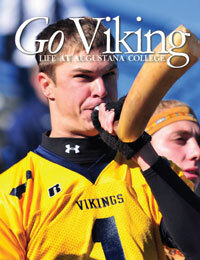 If you have a desire to explore and discover; if you aspire for more than the ordinary; if you, too, wish to be surrounded by interesting people, then I invite you to Go Viking and join us at Augustana.